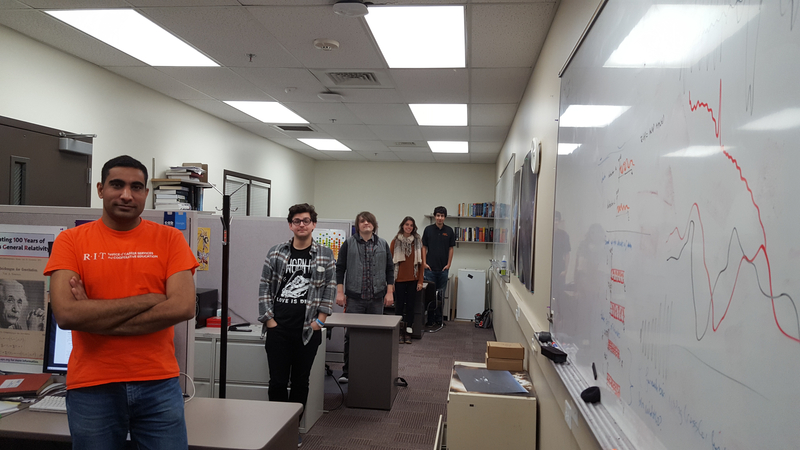 Welcome to the CCRG, located in the Laboratory for Applied Computing (LAC) on the west side of RIT's main campus. ...as well as our main space, which includes meeting areas, office space, and our computing facilities. Here is our main meeting area, where we hold discussions, events, talks, and more. Just around the corner is the office of our director, Manuela Campanelli, along with her assistant Qin Ye. Just next to Manuela's office is the main postdoc office. Next to the postdocs is the main student office, which includes cubicles for graduate students, and a big table for undergraduate researchers and visitors. Downstairs and across the hall is another graduate student office. Around the corner from the downstairs student office, we have some additional satellite offices for postdocs and visiting scholars.